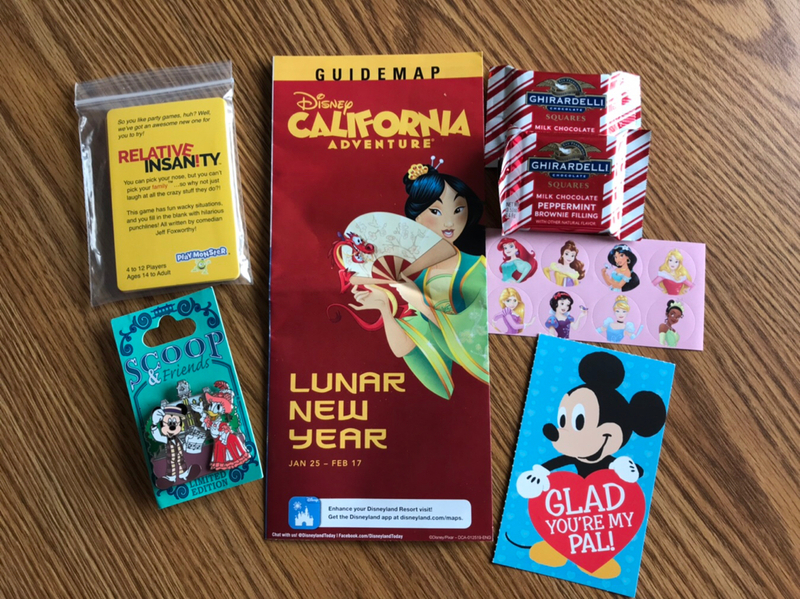 I got my zap package from @krand1276, for one I was super surprised it was in a box >.> .... and inside the box was a bunch of Disney eggs!!! Inside each one of the eggs was a pin! I was like... no way there is a pin in each of these!!! Thank you so much for this amazing pin it up zap!! It was a really fun package to open, I put it back together and opened it twice lol, the eggs also had cute little Disney character on them.. This was super sweet, and very cool package, my sister has already layed claim to scar tie, now she'll be on the hunt for bowling pins thank you so much Kathrine, super amazing very thoughtful! Disneychildwithin, theoucharis, teddy_ruxpin and 3 others like this. Yay! I'm glad you liked it! Hmm, I'll have to check for bowling pin pins. I love this game. It's so much fun! Sorry it took me such a long time to thank you @cyke23 but here it comes. I just came home from New York and thats where I got my zap handed to me. It was this really cute Minnie and Mickey pin and a cute Mickey sticker. Thank you so much! cyke23 and slbrabham like this. Yay! 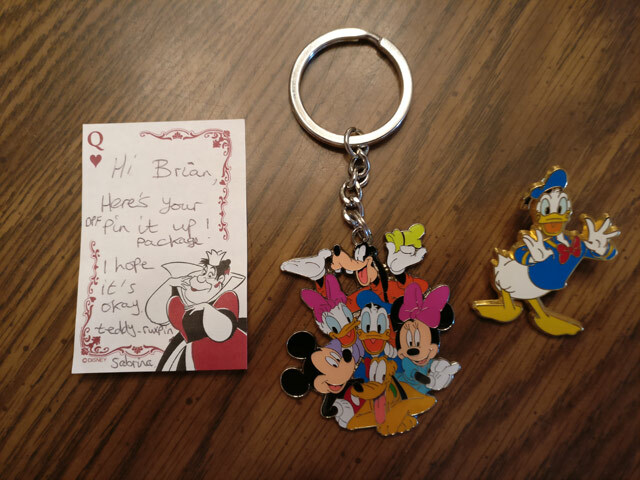 I received a wonderful pin and keychain from Sabrina (teddy_ruxpin) along with a sweet note. It's more than just okay, Sabrina! It's AWESOME! Thanks so much for the great zap! My Dad absolutely loves Donald, so I try to collect pins of Donald Duck for him. This is one I know I haven't gotten for him yet! He's going to love it!!! Your dad has great taste in pins. DawnB sent me this wonderful Oliver and Company pin from my wants list and i really LOVE it ,THANK YOU!! ,Pinpics 27155 WDW Oliver and Company 15th anniversary. I've wanted this pin for a long time and i'm so happy i now have it in my collection! Thank you DawnB ! Thank you so much @krand1276! I got my zap today! krand1276 and slbrabham like this. 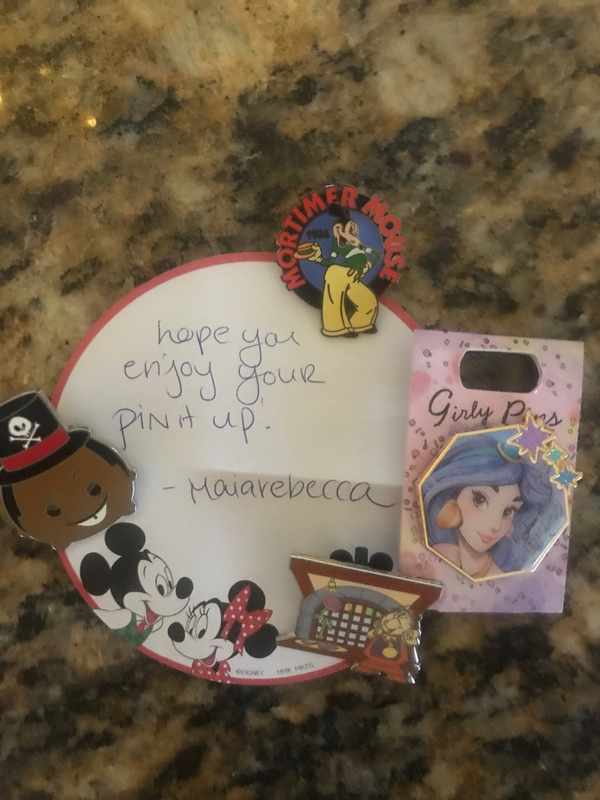 I love the all the pins you sent. They are perfect additions to my collections. Dr. Facilier is too cute. Mortimer Mouse puts me about two thirds complete on the Countdown series. Cogsy is great, and Jasmine is beautiful. Thank you again. Thank you for the package! There were SO many wonderful things in there! When I saw that the outside of the package had cute princess and superhero stickers, I knew this was going to be special! More stickers were on the inside along with (where do I start?) these great handmade Minnie cutouts - one on the note, three on mini tupperware containers (which contained the three pins listed later). Six Chip & Dale buttons (that my husband has already claimed). Two dragon pins (dragons! Yay!!). A sweet Eeyore pin that will go on my collection wall at work. Mickey & Minnie post-it note pad (which will also go to work with me). A fantastic Duets pin of Alice and Queen of Hearts to add to my set! And... (Yes, there's more) a praline dollop/cookie/candy? I'm quite sure what it is, but I am so excited to try it! I've only had praline in ice cream or a candy bar. It looks so yummy! Thank you so much @slbrabham! This was so sweet of you! I'm glad everything was a hit. I enjoyed making the package. Pralines are a Louisiana favorite that I'm happy to share. They are a candy with pecans and super sugary. stitchismyspiritanimal, watzshakinbacon and krand1276 like this. Booger1964, watzshakinbacon, Kerri780 and 3 others like this. I am so glad you like it! I wish I had pins you wanted, but hopefully these will help. I was looking for Leila stuff, but came up kind of empty. Thought maybe the Kinder Joy egg might have something interesting in it. The Jungle Cruise book was pretty cool since it comes with a CD that you can listen to the ride narration and pretend you’re there. Enjoy! And holy cow. I have a “typo” in my handwritten note... Embarrassing. Lol. Wow! @khossler sent me this beautiful Toad pin that I never thought I would get. The pin is amazing! Thank you so much, Kayla! stitchismyspiritanimal, khossler, slbrabham and 1 other person like this. I’m so glad he made it to you!!!! It is a really cool pin! So glad he found his way to a great home. krand1276, watzshakinbacon and slbrabham like this. Many thanks go out to @Booger1964, who sent me a fantastic package of Stitch and Mulan pins that I love, along with a bag of sweet goodies! krand1276, watzshakinbacon, Disneychildwithin and 1 other person like this. 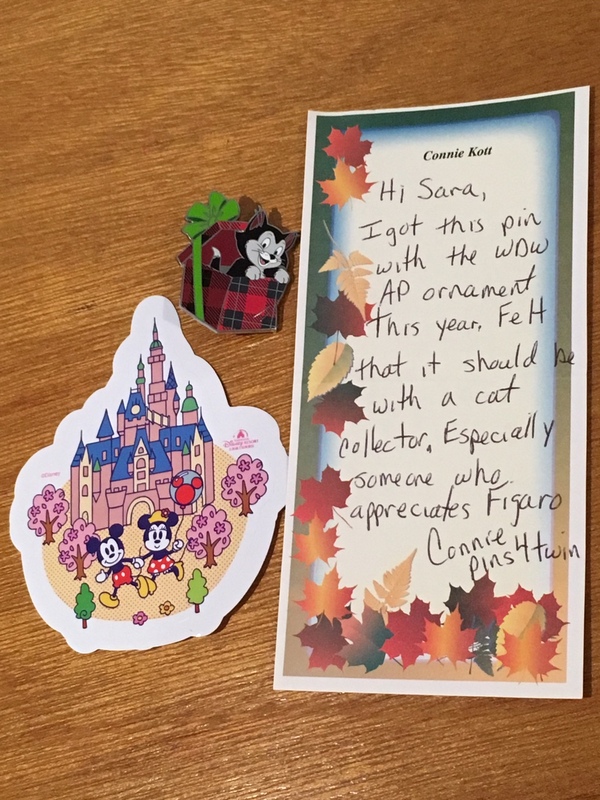 Aahhh - I got the most amazing new Figaro pin from @pins4twin!!! It’s ADORABLE. Thank you so much, Connie! noone, pretty Omi, slbrabham and 4 others like this. Oh, he's super cute! Congrats! I just received this great pin it up zap from Debbie (@GoofyinMadison). Thanks so much! I love it and am so glad to be able to add it to my pumpkin collection! Got this great stuff from @watzshakinbacon. 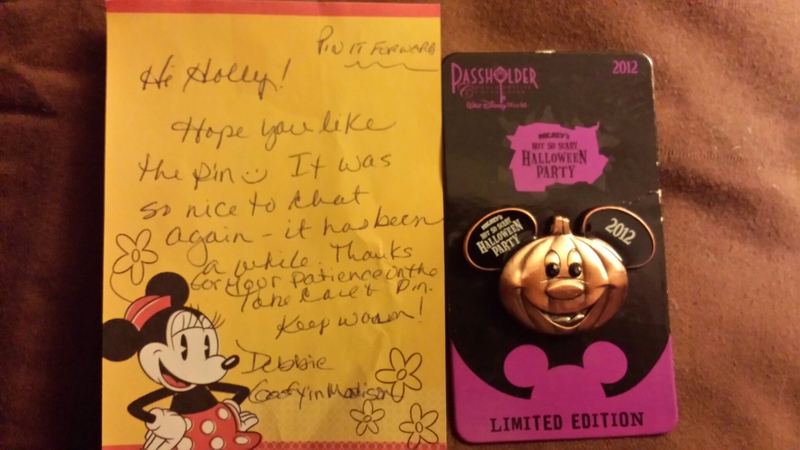 Really nice Scoop and Daisy pin, chocolates and insanity cards. Thanks so much! Booger1964, watzshakinbacon and krand1276 like this.